I have a morning schedule that involves carpooling, dropping 2 people off at different locations and then getting dropped off in time to make a train that is always right on time. It’s a bit stressful trying to make everything come together. The only way to do it is to allow extra time, because things happen. But meditating is also part of my morning routine. It’s easy to let that one part of my routine go. There’s no one depending on me to appear on the cushion. Here’s a confession: I plan 20 minutes in the morning to meditate and when I see that I’m not going to have 20 minutes, I’ve been skipping it. I have an app on my phone called the Zen Timer and it helps me keep track of the time without watching the clock. It also maintains my meditation history and allows me to enter notes into a journal after each sesion. I love using it. It’s been set for 20 minutes for a while now and I somehow felt locked into that. But I realize now that it would be better to meditate every day for at least some time, than to miss my practice because I can’t meet some arbitrary amount of time. What I have started to do is set the timer for 5 or 10 minutes–whatever I know I can do. It helps to take at least some amount of time every single day to pay attention to my breath. I’ve noticed that even a few moments at the start of the day make a difference. During the day I am more likely to remember to pause for a few breaths when I started my day that way. So, how long is it necessary to meditate? Some time. Every day. A few nights ago I attended the first of several meditation classes with Sharon Salzberg at the Tibet House in New York City. There was a packed house with well over a hundred people crammed in on chairs and pillows, and the current exhibit of Tibetan art was moved up agains the walls. Sharon Salzberg was a wonderful teacher. You barely felt like you were being taught. It seemed more like a friendly chat from a down-to-earth person. She was humorous, relaxed and open. Not surprisingly, the crowd was incredibly attentive. No cell phones, fidgeting, or any other behavior that you tend to see at lectures or conferences of the ways that nces. She spoke a lot of about judging your meditation and gave examples from her own experience. She mentioned that one of her teachers liked describe meditation as practice in letting go. One of the ways that Salzberg teaches is to share her own experience. When she tells stories of how she experienced specific thoughts, everyone can relate to it. She speaks through a thought process, showing how the mind jumps from one thing to another and eventually you end up with a thought so unrelated to the firt one that it is funny. For example, she would say she was walking down the street thinking, “where should I go for dinner?, maybe I should try a new vegetatrian restaurant, or maybe I should take the idea of becoming a vegetarian more seriously. I could stop at the bookstore and pick up a few vegetarian cookbooks and give it a try. I really prefer Indian food. Last time I was in India, I especially enjoyed this particular food. I think I should plan another trip to India”. . . and so on. From trying to pick a place for dinner, to a visit to India, all in a few seconds. Everyone laughed, recognizing what many of us could relate to. As she pointed out, this was a rather innocuous, lighthearted example, but often times the thought process takes us to a place that is not so lighthearted. Salzberg spoke of how the body reacts to what the mind is thinking and if you stop to recognize where your mind is going, you will also see what is happening to your body at the same time. She spoke very easily through the 2 hours, with a very brief break in between and two separate meditations lasting perhaps 20 minutes each. In fact, she said that she doesn’t like to tell people how long to meditate but as a reasonable, random number that makes some sense, she suggested 20 minutes. It’s important, though, to do something regularly. Even if it is as little as 1 minute or 5 minutes every day and possible at the same time every day. You won’t realize the effects immediately but others might notice something different about you after a period of time and ultimately you too will notice. I have always felt a little weird sitting on the floor with my eyes closed doing nothing. When I am home alone and I sit down to meditate it’s not a problem but if I’m going to meditate every day, I’m not always alone. Fortunately, over time, my husband has come to not only accept my practice but to support it. Maybe he notices how much calmer I tend to be after sitting or maybe he notices that after consistently practicing, I have actually changed the way I respond to him. Whatever the reason, it helps to have the support. At the very least, it’s necessary to help others in the household understand that when you practice, you would appreciate not being interrupted. At best, they would actually encourage you to keep it up. 1. Help your family understand that this is a commitment you are making to yourself. Just like losing weight, getting a new job, or getting a degree, it requires application and energy and that they can help by doing what any family does, which is support each other in achieving their goals, without judging them. 2. Let members of your household know when you would like to practice. Try to pick a time that works for you but takes into consideration the needs of others. If you let others know what time and where you will be sitting, it will be easier for people to know when not to interrupt. 3. 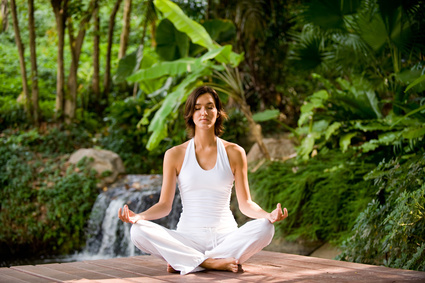 Address any concerns that people bring up about the fact that you are going to be meditating. Although we are a society of doing and moving, there isn’t anything objectively strange about sitting quietly. Some people also think that meditation is a religious activity that is associated only with Buddhism. There are meditation traditions in in Jewish and Christian religions as well as many others so if your family is concerned that you will be living on a commune in India, reassure them. Mindfulness meditation is now used by medical, legal and business people and other “mainstream” people to improve concentration, improve performance, reduce stress, improve decision making and promote healing. 3. Show your appreciation when get support. Have you come up against obstacles to your practice from others? What have you experienced?